St Joseph's School had its beginning with the arrival in Stanthorpe by four Sisters of Mercy on the 9th February 1875. The four Sisters were Sisters M Agnes, Emilian, Muredach and Malachy. This small group of dedicated Sisters pioneered Christian education enduring great hardships in the fulfillment of their apostolic mission. 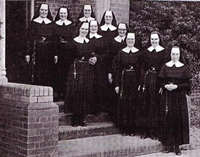 The foundation stone for the Convent building now on the Secondary campus was laid on 11 October 1931. The building cost the grand sum of 12,258 pounds and was solemnly blessed and opened by his Lordship DR J Byrne, Bishop of Toowoomba on the 17th April 1932. The original school was formerly the Globe Hotel. The school occupied the position more or less where the current Presbytery now stands. It was thought that its initial roll call was in excess of 120 students, some of whom had travelled considerable distances by foot from the outlying tin mines. The original 'school' consisted of one large room with the barest of necessities. In 1884, St Joseph's School had its first inspection by an Officer of the State Department who reported very favourably on the school, teaching and results generally. However, the building was in a bad state of repair and the winter winds whistled through the floor, ceiling and walls. But for all of this the old Globe Hotel was to remain the school until 1907 and the arrival of Fr Matthew Ryan as Parish Priest. A new school was built on the site that is now the Secondary campus of St Joseph's. The original church built by Fr Davadi was also pressed into service as an Infants’ school and was joined to the wooden building built by Fr Ryan. In 1955 the old school was sold for removal and the primary students moved to the site of the current St Joseph's primary campus. The present Primary campus was part of the Moiaminda Guest House, which was occupied by Somerville House Girls from Brisbane during World War Two. In 1987 the school’s last Sister of Mercy staff member retired. In 1999 St Joseph’s extended to Years 11 and 12 for the first time in its long history. Over recent years the Primary campus has undergone a building program, including the completion of the Mercy Centre, the current Administration building. At the same time, the Secondary campus has undergone refurbishment and upgrade. The Frayne Building on the Secondary campus was the most recent building to be completed in 2014.